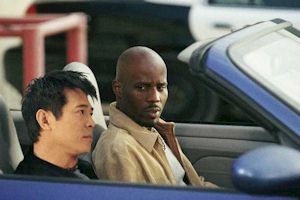 (left) Jet Li objects to somebody's fist, and (right) Li and DMX go cruising. The Skinny: Take Romeo Must Die, add a smidgen of Exit Wounds, then subtract Steven Seagal from the equation, and what do you get? Cradle 2 the Grave, the latest in a recent string of "martial arts meets hip-hop" flicks from producer Joel Silver. Whether that's a good thing or not remains to be seen. I am a huge Jet Li fan. In fact, if it weren't for him, I probably wouldn't have developed such an obsession with Hong Kong cinema, and certainly wouldn't be writing for LoveHKFilm.com. While growing up in Middle America, I had a somewhat limited knowledge of foreign films. For the longest time, all I knew about Chinese movies were the ones by Bruce Lee (and his imitators) and those poorly dubbed chopsocky flicks that the local channels would show on Saturday mornings. But on a trip abroad to Singapore, I had the distinct pleasure of watching Once Upon a Time in China 2 on the big screen. The experience was nothing less than magical. Much like seeing Christopher Reeve take flight in Superman: The Movie or Mark Hamill wield a lightsaber for the first time in Star Wars, watching Jet Li take on the role of the venerable Wong Fei-Hong in that Tsui Hark classic left an indelible mark upon me. From that moment on, I sought out and voraciously devoured as much HK cinema that I could get my hands on. So it's no wonder that I have a soft spot for Jet Li and rush to see each new film he's involved with on opening night. Which brings us to his latest project, Cradle 2 the Grave. There's a certain "Catch 22" dimension to Jet Li's American success. On one hand, it's gratifying to see Li begin to approach an almost household name status in America on par with a Bruce Lee or a Jackie Chan, but on the other hand, it's sorely disappointing to see the great Li attach himself to such inappropriate starring vehicles. Romeo Must Die, The One, Kiss of the Dragonwere any of these truly great films? For Li fans, I'm sorry to report that Cradle 2 the Grave does not dramatically rise above this established Hollywood standard. But on the bright side, it doesn't sink far below it either. Taking a cue from Romeo Must Die and the Rush Hour series, Li is paired with hip-hop superstar DMX. The need for suspension of disbelief has never been so necessary. The plot involves Tony Fait (DMX), who we are supposed to believe is a jewel thief who robs only from the "bad people," abhors using firearms, and most importantly, is a sensitive, doting father of one. Sure, I'll buy that. 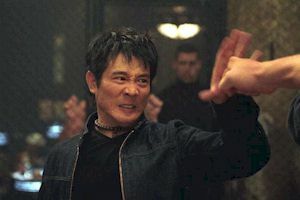 Jet Li plays a boy named Su (sadly, no Johnny Cash remix on the soundtrack), who forms an uneasy alliance with Fait. It seems that Su is a Taiwanese agent in pursuit of some elusive black diamonds that Fait has stolen in a jewelry heist. But Su isn't the only one who wants the diamondsthe villainous Ling (Mark Dacascos) will stop at nothing to obtain "his preciousss." In a scene very late in the film (which feels like tacked on exposition), Ling is revealed to be Su's former partner, whoas movie bad guys have a tendency to doturned traitor. To summarize the rest of the plot in a sentence, the evil Ling and his cronies kidnap Fait's daughter, get the weapons-grade diamonds back (don't ask), try to sell them to some arms dealers, and basically await Su, Fait, and the rest of the gang for the final confrontation. If you thought Kiss of the Dragon had a gruesome ending, wait until you see what happens to poor Mark Dacascos. Despite my playfully sarcastic comments, Cradle 2 the Grave was not a horrible experience. While dumb and predictable, the film is admittedly entertaining at times. That's the dilemma. How can I pan a film that I was generally amused by? The main reason, I think, is that the film just feels like recycled material. In some instances, that can be a good thing. The fight scenes, the ATV chase, and even Li's freefall drop at the beginning, all seem reminiscent of the Hong Kong craziness that hooked most of LoveHKFilm.com's readership to HK movies in the first place. And to the filmmakers' credit, the awkward, groan-inducing wirework of Andrzej Bartkowiak's Romeo Must Die and Exit Wounds has been practically eliminated. Still, the execution of said fight scenes leaves something to be desired. On a purely conceptual level, the kung fu sequences are intriguing. Seeing Jet Li face off against a bunch of ultimate fighters in a cage match? Sounds great. Jet Li dueling with Mark Dacascos in a ring of fire? Sounds like the makings of a classic scene. But the first sequence isn't as thrilling as one would hope, and the latter seems a little too derivative of Jet Li's climactic battle with Russell Wong in Romeo Must Die. Granted, Brotherhood of the Wolf's Mark Dacascos makes for a more compelling adversary, but it still seems a little too "been there, done that." Performance-wise, Jet Li and DMX swagger through the proceedings with a certain charming panache, but they both deserve better material. For DMX, his father-daughter scenes are supposed to come across as tender and heartwarmingin effect, the emotional core of the movie. But instead, the awkwardly scripted heart-to-hearts feel more than just a tad weird (to all jewel thieves out there who are faithful, loving fathers, I apologize). At least the supporting players in the Joel Silver Actors Troupe do a competent job of keeping the audience entertained between the action sequences. Gabrielle Union and Kelly Hu (alas, playing yet another dragon lady stereotype) up the film's sexiness quotient while Exit Wounds alums Tom Arnold and Anthony Anderson (who appeared with Jet Li in Romeo) almost steal the show with their well-placed comic banter. Notes:  Stay for the credits, when supporting actors Tom Arnold and Anthony Anderson seemingly ad-lib an entire comedic routine. They did something similar at the end of Exit Wounds, also directed by Andrzej Bartkowiak, who possesses possibly the most misspelled name in the history of American cinema.  Fan interest generated on Jet Li's official website actually resulted in Mark Dacascos being cast in this film.  Believe it or not, the movie started out as a remake of Fritz Lang's M (1931), which involved cops and crooks teaming up to capture a child killer.  Though not a hip-hop fan per se, LoveHKFilm.com reviewer Sanjuro bought the Cradle 2 the Grave soundtrack, thereby destroying any credibility he may have had. It is the first rap album he has purchased since Hammer's numerically titled "2 Legit 2 Quit".